Wampanoag Chief Earl Mills Sr. of Mashpee and author Alicja Mann of North Falmouth have collaborated on this book which presents Mashpee, Massachusetts, as it once was and is today. The book addresses a variety of topics, from the history of the Wampanoags of Cape Cod to the dramatic changes in the Mashpee community following the Wampanoags' well publicized and unsuccessful 1976 lawsuit to reclaim their land. 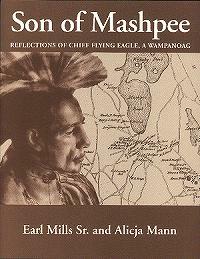 Part biography, part history, Son of Mashpee is a portrait of Chief Flying Eagle, Earl Mills Sr., and his family, with a strong emphasis on the heritage and legacy of the Wampanoags. The book consists of three parts: Roots, Childhood Vignettes and Heritage. All are richly illustrated with maps, drawings and photographs, some even dating back to the 1800s. Son of Mashpee is printed in sepia on acid-free paper for archival preservation. Why is Son of Mashpee an important book to see and read? Wampanoags are the Native Americans whose first encounter with the Pilgrims set the course of the history of New England and, to some extent, the history of this country, yet the Wampanoags' stories are not told, the Wampanoags' voices are not heard. The authors of Son of Mashpee were determined to change that. Cape Cod Times recommends Son of Mashpee as a ". . . highly readable, often humorous and thoroughly entertaining book that should be read by anyone who doesn't have an understanding of the tribe's importance to Mashpee and Cape Cod." 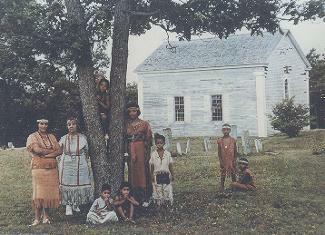 Joan Avant Tavares, Owamasqua, Mashpee Wampanoag Tribal Historian and long-term Director of Indian Education, Mashpee Public Schools, states "This book becomes an important piece of contemporary literature filling the great void in the source of information concerning Mashpee Wampanoag heritage. 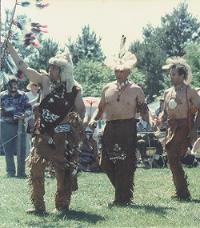 Individual voices from the Native American community are finally heard. For those who are interested in learning about our heritage and our culture, this book has made a vital contribution." The Falmouth Enterprise: "Mr. Mills' memories are evocative of a time so different from the one we live now, a time when small towns were complete unto themselves, when everything one wanted or needed was within reach . . . ."
Ron Welburn, Associate Professor, English Department, University of Massachusetts: Son of Mashpee portrays the Mashpee Wampanoag community from the inside. I enjoyed the way Earl Mills Sr.'s long memory offers readers glimpses of his family and his people's legacies by combining numerous valuable photographs with his narrative and conversation with co-author Alicja Mann. I'd recommend this book as a resource for middle school through university students and teachers. The spirit of my parents and grandparents lives in the woods of Mashpee and in the memory of the people. I am a link between them and my children and grandchildren. Earl Mills Sr.
Earl Mills Sr., Chief Flying Eagle, has lived in Mashpee since his birth, with the exception of time spent in the Army and pursuing his education at Arnold College in Connecticut. 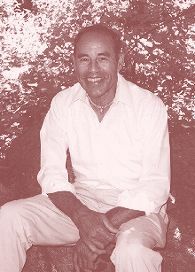 He has been Chief of the Mashpee Wampanoags since 1956, has organized many pow wows and was the driving force behind the renovation of the Old Indian Meeting House, one of the most significant historic landmarks on Cape Cod. Mr. Mills has also made his mark on the Cape as a devoted teacher of physical education and most recently as the founder of The Flume, a well-known Mashpee restaurant. This book came about because "there is a great need in me to share with others that which I remember and that which I know about Mashpee." Alicja Mann was born and educated in Poland from where she emigrated to the United States in 1972. She made her home on Cape Cod, became a mother and worked for several years as a scientist and translator. After becoming more comfortable in her new country and language, she left science in 1985 to pursue her writing. 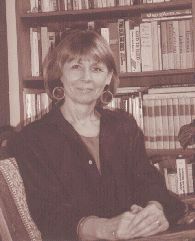 Ms. Mann has written numerous feature stories, profiles of personalities and social-political commentaries, many of which were published in regional and national newspapers and magazines, including the Cape Cod Times, The New Leader, In These Times and Cape Cod Life. She is a former Op-Ed columnist of the Cape Cod Times and the author of A Cup of Sky, a collection of her poems and essays. Soft-cover,128 pages, 8 1/2" x 11"
© 1998-2008, Word Studio, all rights reserved.